It's Halloween this weekend so there are plenty of Halloween themed gigs and parties on. Here are some picks. 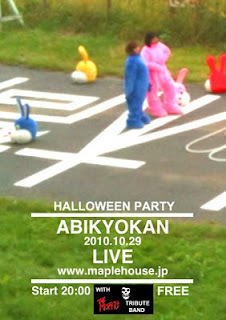 On Friday night, there will be an interesting free party at Maple House in Gakugei-Daigaku. Performing will be a Misfits tribute band, as well as the multi-national group ABIKYOKAN (who I'll be playing bass in), who sound nothing at all like the Misfits! It opens at 8:00. Details on TGG. On Saturday night, go down to Ruby Room in Shibuya for Bad Noise. 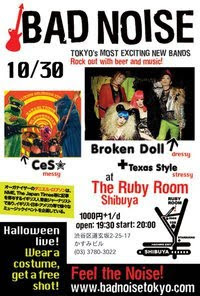 The bands performing are BROKEN DOLL (Fashion-obsessed neon new-wave punks), CES☆ (Hard-rocking yank chick and three bears), TEXAS STYLE (Explosive three-boy garage rock unit). If you dress up in any kind of costume, you can get a free shot! Details on TGG. 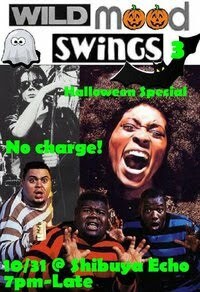 On Sunday night (Halloween), catch the 3rd instalment of WILD MOOD SWINGS schizophrenic all-genre DJ party at Echo in Shibuya. It's free and starts at 7pm. The DJs will be Timebred (Gaijintonic), craig eee (me, Tokyo Gig Guide), Grant McGaheran & Jake Arntson (Abikyokan), Special K, Mu-tan and more. Everyone's welcome, costumed or otherwise! Details on TGG.